Plainfield City Hall is located at 515 Watchung Avenue, Plainfield, NJ 07060; phone: 908-226-2571. Photo: Nathaniel Drake House, ca. 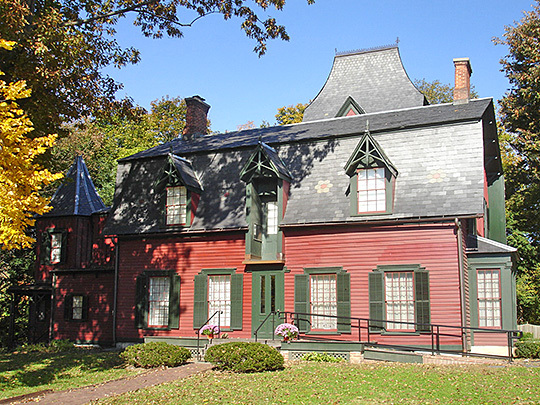 1746, 602 West Front Street, Plainfield, Union County, New Jersey. Listed on the National Register of Historic Places in 1973. Photographed by User:KForce (own work), 2012, [cc-by-3.0 (creativecommons.org/licenses/by/3.0)], via Wikimedia Commons, accessed April, 2013. Settled by Quakers in 1684, Plainfield was incorporated as a township in 1847 and as a city in 1869. Plainfield is a busy commuters' town (New York City) with smart shops and substantial manufacturers. Here are all types of dwellings from the huge, French-roofed, high-ceiling Victorian mansion of the 1870s to the most modern Cape Cod type cottage.